Sen. Norm McAllister prepares for the 2015 legislative session Tuesday morning in the Senate chamber. Embattled Sen. 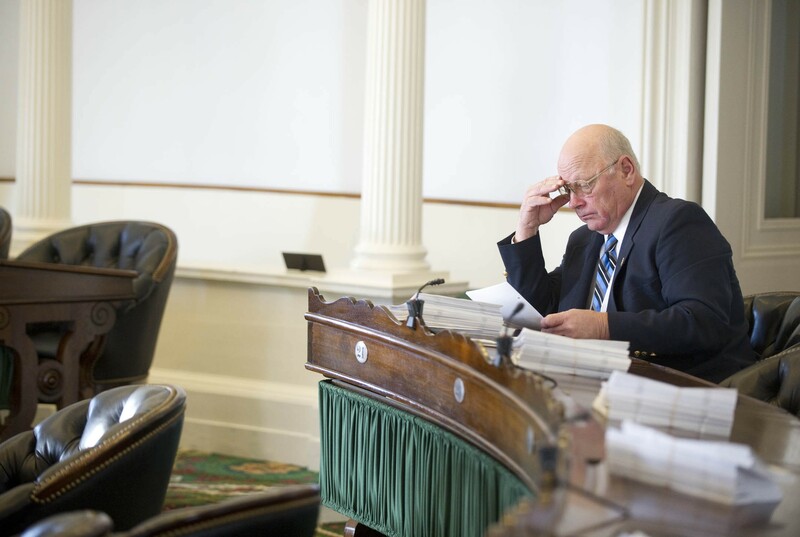 Norm McAllister (R-Franklin) showed up early to work Tuesday morning, taking a seat in the mostly empty Vermont Senate chamber and flipping through stacks of pending legislation. The Highgate farmer sat alone in his aisle seat as his colleagues ambled in for the first day of the 2016 legislative session. Every now and then, a small pack of reporters, armed with microphones and television cameras, approached McAllister. One asked how it felt to return to a Senate from which he may soon be suspended. "Look at this!" he exclaimed, gesturing to the reporters. "What do you think? It's a little uncomfortable, but I'll get over it." McAllister said he was simply hoping to "get through today — and tomorrow. That'd be it." A week before the legislature adjourned last May, McAllister was arrested outside the Statehouse and charged with sexual assault. He pleaded not guilty and is awaiting trial. Much of Vermont's political establishment called for his resignation from the Senate, but McAllister demurred. In December, the Senate Rules Committee approved a resolution to suspend the senator, pending the conclusion of his criminal case. Not long after gaveling in the session Tuesday morning, Lt. Gov. Phil Scott formally took up the resolution and scheduled it for a floor vote Wednesday at 1 p.m. Senators sat stone-faced as he briefly explained the procedure surrounding the vote, which will allow for debate and amendments. After Scott presided over the introduction of dozens of new bills, Senate President Pro Tempore John Campbell (D-Windsor) addressed the chamber and appeared to allude to the looming suspension vote. "This year we have a lot of issues that we’re going to be dealing with that are going to be, some controversial, some very difficult to deal with here in this chamber," Campbell said. "And I would ask that, as always — that we treat each other with respect and courtesy, even if our views may not be the same." It wasn’t immediately clear Tuesday whether the suspension resolution had the votes to pass, though its supporters privately expressed confidence. 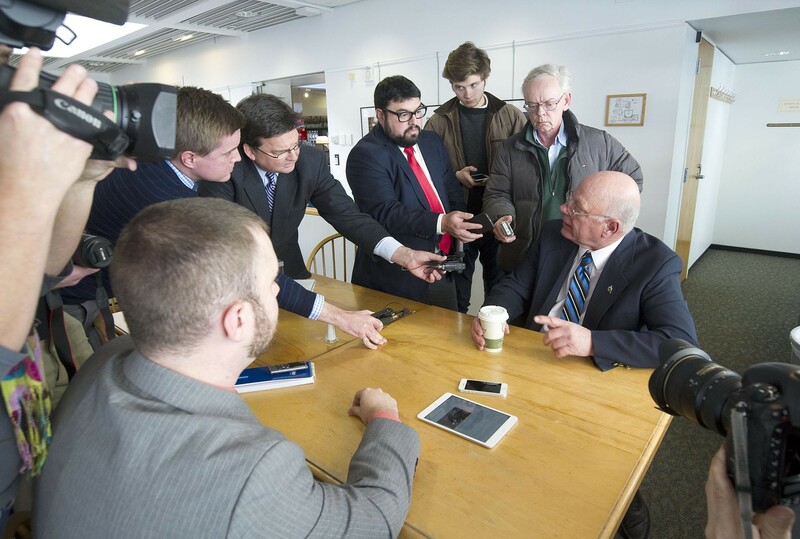 Neither Sen. Joe Benning (R-Caledonia) nor Sen. Phil Baruth (D-Chittenden) — leaders of their respective caucuses — would say where they expected their colleagues to land. “I think it would be safe to say there’s a strong, divided opinion on the subject,” Benning said of his fellow Republicans. Supporters of the suspension resolution appeared eager to avoid a prolonged debate, though Baruth said he would not try to limit it. That includes McAllister himself, who indicated to reporters Tuesday that he would "probably" address his colleagues Wednesday, though he would stick "strictly to the proceedings" and would not discuss the underlying allegations. One of his staunchest allies, Sen. Peg Flory (R-Rutland), may also introduce an amendment that would postpone McAllister’s suspension until the resolution of his criminal case. Flory has long argued that acting sooner would violate McAllister’s right to a fair trial and to the presumption of innocence. The Rules Committee, on which she serves, rejected a similar amendment in December by a 4-1 vote. Flory’s new amendment is more specifically tailored to McAllister’s case. She said Tuesday that she was not yet sure whether she would introduce it. “Depends on how the arguments go,” Flory said. Scott, a Republican candidate for governor, made clear Tuesday where he stands on the matter. After Scott gaveled out the Senate for the day, McAllister spoke briefly to Sen. Bobby Starr (D-Essex/Orleans) and then left the chamber. Trailed by reporters, he walked alone through the halls of the Statehouse. He bought a cup of coffee in the cafeteria and sat down at a table occupied by Vermont Republican Party executive director Jeff Bartley. "Come on, guys. Really?" McAllister said with a laugh. Reporters interrogate Sen. Norm McAllister Tuesday morning in the Statehouse cafeteria. Asked what he planned to do the rest of the day, the senator said he expected to attend meetings of his former committees, though he was dismissed from both last May. He said the morning's session "was not a whole lot more weird than it ever is." He added, "Everybody treated me cordially. That's all you can ask, right?" McAllister vowed again not to resign, saying, "I came here to do the job that I was elected to do. And that's what I intend to do." WPTZ-TV reporter Stewart Ledbetter asked the senator whether he had any plans for Thursday, the day after his potential suspension. McAllister appeared to misunderstand the question, assuming that Ledbetter was referring to Republican presidential candidate Donald Trump's planned visit to Burlington that day. "Thursday," McAllister said, laughing again. "Oh, you mean that little thing going on in Burlington? You know, I didn't get a ticket for it." "No, I didn't mean that," Ledbetter said. "If they vote to suspend you, what will you be doing Thursday?" Vermont Press Bureau reporter Neal Goswami clarified. Disclosure: Seven Days journalists, including Paul Heintz, have been subpoenaed to testify in Sen. McAllister's criminal case.